When we first were looking for a Bernese Mountain Dog puppy, breeders cautioned against having too many stairs for the puppy to climb. Too much stress on their growing hips. So we carried Adler up the three flights of stairs to our condo until she was 6 months old and too heavy! When Adler was 2 1/2, we moved to the first floor with minimal stairs. Well, it was a duplex so there were carpeted stairs down and she seemed to do okay with those. 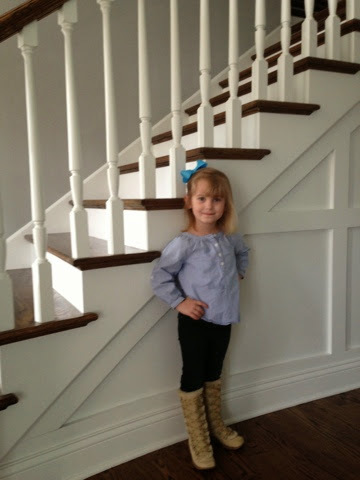 Fast forward five more years and we move to a multi level house with hardwood stairs. Never mind that she is nine years old and the arthritis has started to set in. The back stairs aren't as polished and a little easier for her. The front stairs are a total hazard not just for her but anyone with socks on their feet. 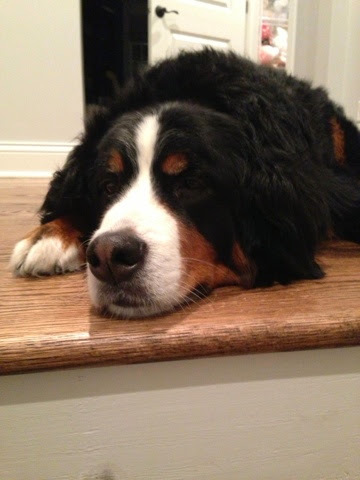 In fact, Adler would once again come to bed with us and in the middle of the night try to go back down the stairs. Her loud nails and slipping on the hardwood floors as she struggled to go down them in the dark made me bolt upright in the middle of the night in case I needed to rescue her. After a couple of these incidents and us determining it was just a matter of time before she fell and really hurt herself, we did two things. One, we decided to carpet our beautiful hardwood front stairs. We did this not only for Adler's safety but the safety of our kids, their friends and all other visitors to our house. Second, we started closing the door to our bedroom at night so Adler couldn't wander and decide she wanted to go down the stairs in the middle of the night. 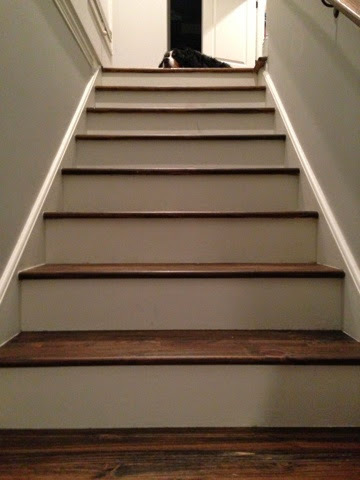 She too has also become smarter and sometimes now decides to greet us at the top of our lower level stairs when we come home...well, at least if we have only been gone a short while! My baby turned 7 months old recently. I want to soak up these moments of her just being little. She is no longer a newborn; she's grown out of her 0-3 month clothes and stretching out her 3-6 ones. 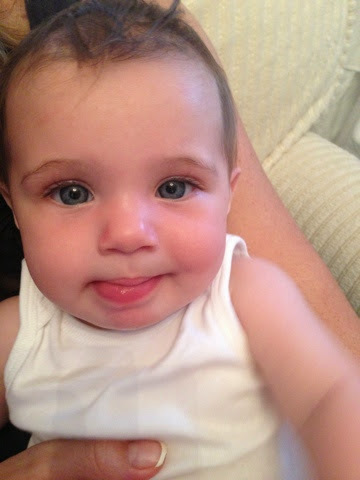 She has two new teeth, as I mentioned. Her hair is coming in thick and brown. Maybe I will have one brunette with piercing blue eyes. What a stunning combination! Add to that a beautifully, happy child who smiles all day long and adores her older brother and sister. One who watches her dog with interest and grabs fistfuls of her hair, lovingly of course! Our sweet girl (as I call her and Adler - don't ask why I don't call Peyton that as that is a post for a different day when I can describe my sarcastic, feisty, strong-willed daughter who challenges me but whom I wouldn't have any other way! 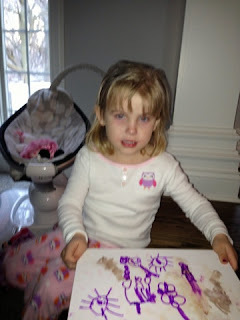 ), has started to discover her hands and feet, trying to mimic how we wave bye bye. Tom is practicing DaDa with her and her babbling is more consistent now with similar sounds as her speech readies for prime time. 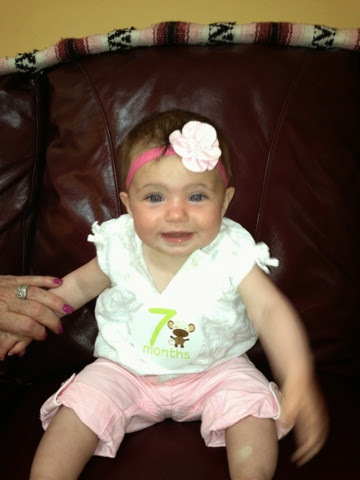 "Seven months old already! ", I exclaimed the other day. Instead of counting the months, I will be counting the moments. The months go way too fast. The moments, they can live on in eternity. Austen lost a big one and Hailey now has some! 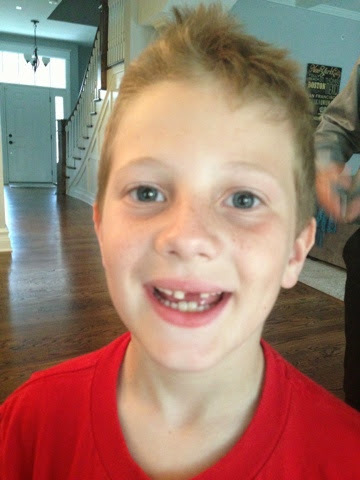 Last week, Austen wiggled out one of his front teeth. He is almost 7 1/2 and so far has lost only his two bottom teeth and that seems like a long time ago! His teeth just don't seem to want to fall out! So Austen lost some teeth and almost the very next day, we noticed Hailey's two bottom teeth had come in. It's amazing how that Tooth Fairy works. She giveth and take it away all in the same week! Anyway, both are doing great. Austen cried a bit when his tooth came out since a bit of blood came with it but Hailey, in true form, barely made a fuss about her new pearly whites. That included her refusing to open her mouth so I could take a picture! Peyton. Peyton. Peyton. Oh how I love the number 4. Turns out two out of three of my kids who have reached that number have chosen that year to be challenging children. Austen grew out of it and Peyton will too I presume. Here is just a snapshot of what my 4 year old did recently while the babysitter was home and thought she was playing quietly in her room....little did she know! 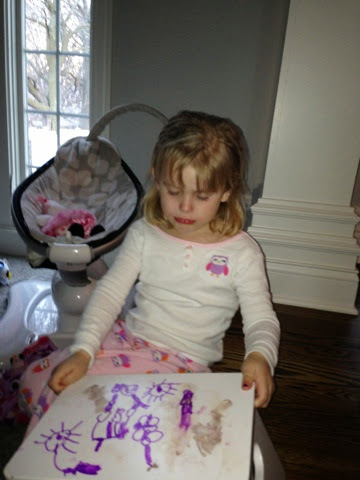 Note the red rimmed eyes from crying when she had to tell Tom and me what she had done. Now, I am not a fan of what she did but I was thinking this could be worse, she could have cut her hair! For Christmas, Austen received a Lego light in his stocking. It is a little one that clips onto his bed so he can read at night. Truthfully, I doubt he is doing much reading at night but he likes it and he is a pretty good kid about going to bed so I don't mind that he has it and plays with it a few minutes before going to sleep. One night, Austen noticed it was missing. He has a bunk bed and he sleeps on the top so it was hard to get up there and look but we did and couldn't find it. We had just changed the sheets on his bed so we thought it must have fallen down when we moved the mattress. We looked on the ground and behind the bed (not an easy feat as it is up against the wall). But we couldn't find it. A week goes by and still no sign of the Lego light. Tom goes to check on Peyton who is playing quietly one day and notices her playing with what else...the Lego light! He says, you found the Lego light? Startled, she looks right at him and says, Austen found it. She goes back to playing and Tom doesn't mention it. The next day, Austen says he can't believe he still hasn't found his Lego light. Tom says, I thought you found it? Peyton was playing with it the other day? Puzzled, he looks at us and says a little exasperated, no! At that exact moment we all look at each other. For we know that our 4 year old is not only now capable of climbing up in Austen's bunk bed but also of fabricating stories with a straight face. The Lego light was found shortly afterwards in her Lego bin. You got to hand it to her. That kid has some guts and a whole lot of personality to go with it!